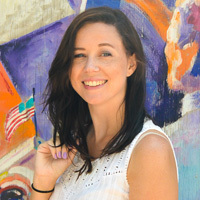 When I first heard about marbling paper with shaving cream and food coloring, I had visions of preschool finger painting art. I mean, how can you possibly get those gorgeous swirly patterns with those two items? But I’m always up for a challenge and I was stoked with the results. In fact, I became slightly addicted with DIY Marbled Shaving Cream Art! 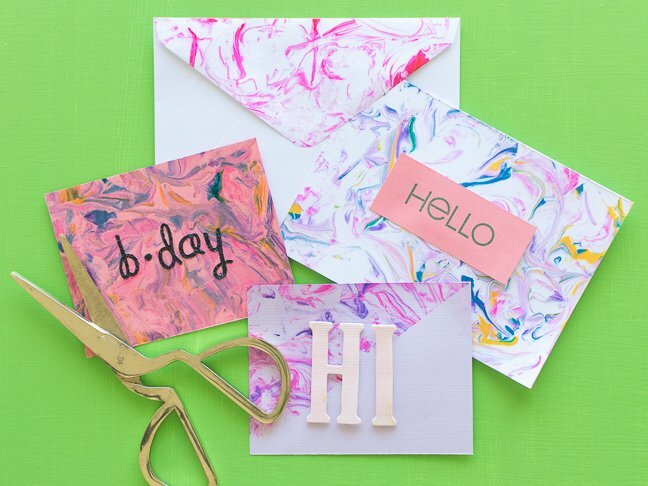 You can get really creative with this technique and apply tape to block off certain areas of the art, like only marbling the flap on an envelope or half of a card. Remember, you don’t have to stick to just white paper either! The color will show on any light colored paper. 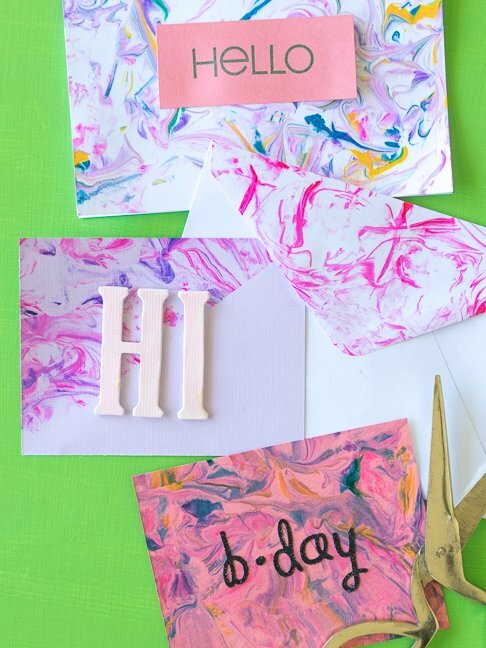 Use the marbled paper to make cards or let your kids make art for your home. 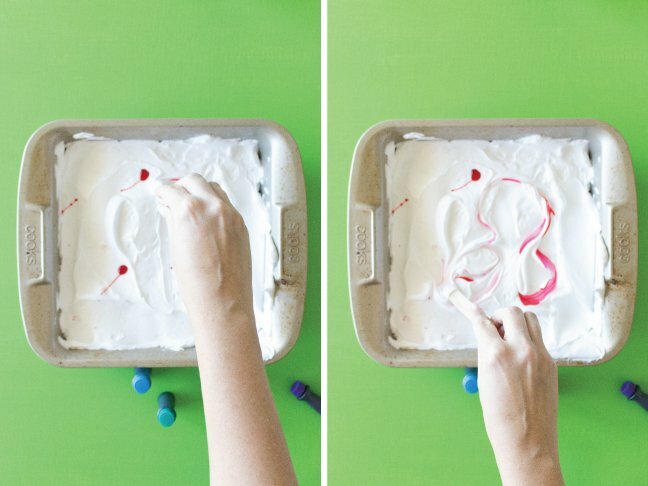 It’s a fun, simple project for adults and kids, and when you’re all done, simply wash the pan. 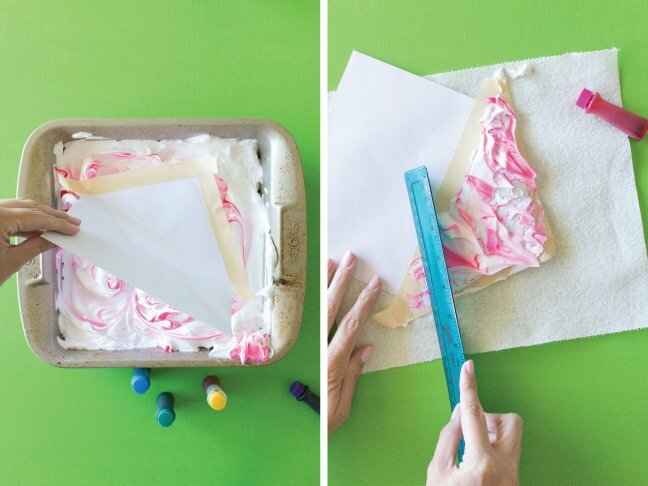 Want to make your own DIY Marbled Shaving Cream Art creation with or without your kids? Just follow the steps below. Step 1: Lay down newspaper or plastic to protect surfaces and wear an apron as food coloring will stain surfaces, clothing, and even hands. Step 2: Fill a large pan with a thick layer of shaving cream and smooth with a spoon or spatula. Step 3: Add several drops of desired food coloring over the shaving cream. 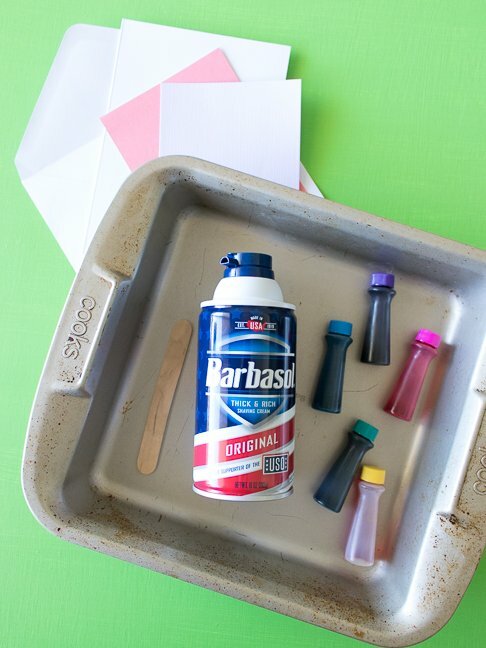 Use multiple colors or just one, and note that you can scoop out the shaving cream and add more whenever you want to switch colors. Step 4: Swirl the colors together with the popsicle stick to achieve the marbled look. Step 5: Carefully lay the paper over the shaving cream and press lightly to coat the entire side of the paper. If using something like an envelope, tape off the areas you do not want marbled (see above). Step 6: Peel the paper off the shaving cream, set on a paper towel and use a ruler to scrape off the shaving cream and dispose. Peel off tape immediately if using. Allow the paper to sit for about 5 minutes before touching. After that time, it should be all done! Step 7: Add stickers and stamps to customize your creation!